Perfection Floor Tiles are a flexible interlocking tile manufactured in USA. Our tiles are designed to cover an old surface by simply loose laying our tiles directly over the current subfloor with minimal preparation. Use in many applications to cover old concrete, cracked concrete, paint, commercial carpet, old linoleum - simply install our tiles directly over the old surface. Easy do it yourself installation, the tiles can be firmly locked together in a matter of minutes using only a rubber mallet. You don't have to remove paint, or do much floor prep prior to the install - if you have severely uneven surface, or large cracks then give our sales staff a call to discuss best options. 4.5MM Thickness is best for residential/light commercial applications. Foot traffic, light vehicle traffic. 5.5MM Hidden Locking Joints are best for residential/light commercial applications. Foot traffic, light vehicle traffic. 5MM Commercial Thickness is best for commercial light traffic such as vehicles, hand trucks, lighter forklifts or pallet jacks. 7MM Industrial Thickness is heavy traffic such as vehicles, hand trucks, lighter forklifts or pallet jacks. * All thicknesses will handle heavy traffic when adhesive is used. Be sure to consult our sales staff with any application questions. PVC Tiles by Flexi-Tile by Perfection Floor Tiles are Commercial and Domestic Tile is made from Virgin Polyvinyl that is carcinogen free material and is therefore resistant to most chemicals. It offers a long lasting guarantee for your professional flooring. Our tiles are flexible yet durable, an anti-fatigue floor system which is a sound absorbing comfortable floor system. Our tough flexible interlocking floor tiles have been developed to provide an “instant” self laying floor surface, for use in a wide variety of residential and industrial applications. The original “jigsaw” profile is used on all four sides of the tiles and can be “locked” firmly together in a matter of seconds using only a rubber mallet. A complete floor can be laid, or lifted in a short time, without any need for expert labor or adhesives, thereby giving you significant savings in the total costs of a finished floor area. Suitable for garages, basements, gyms, kid's rooms, family rooms, patios, workshops, laundry rooms, etc. Commercial applications include showrooms, factories, retail locations, military, warehouses, factories, plants and more. Not recommended for outdoor use. A great feature about this product is that it is loose laid, and can be moved to another location easily. Flexi-Tile is easy to maintain because it resists staining and is unaffected by household chemicals (do not use bleach). Please note: Animal urine and feces will cause tile to discolor. Acids in some food products like tomato paste may cause white tile to discolor. Also, some high end oil based tires can leave a stain. A sealant may be suggested to help against stains (see our optional products listed below). Elite Xpressions LLC does not offer any product warranties. All Warranties are offered by manufacturer. You do not need to do any special preparation to sub floor prior to installation for normal installation conditions. Simply clean, or sweep the area. No patch work is required to the sub floor, except in some extreme conditions. If you have a crack in the foundation you may choose to repair it, but it is not necessary. If you do have large cracks, or an uneven surface, you may notice an indentation in the tile over an area of sub floor that has integrity issues. It should not cause damage to the tile, but if the seam falls on a large crack where there is traffic then the seams may come apart. These tiles can be laid over concrete, commercial carpet, paint, epoxy, tile, wood, and many other types of subfloors without requiring the removal of the old subfloor. This tile does not work well on top of plush carpet, the edges will disconnect. To insure easy installation, remove the tiles from the cartons and spread them out on the floor where they can acclimate to room temperature. Under normal conditions glue is not recommended and the tiles should be loose laid. If your application calls for some adhesive to be used, any non-hardening flexible adhesive may be used. No special preparation to the sub floor, simply loose lay your tiles and press locking keys together. Tiles are easy to trim with a sharp knife, or blade. Install the tiles all the way to the wall leaving a 1/4" gap for expansion/contraction, and trim excess, or leave some space for the optional finishing edges. In rare instances some rubber products may stain the tile's surface. Test by placing a single tile under rubber tires, chair bottoms, ect - leave for 48 hours prior to installation. If concerned about staining you may consider using one of the sealer products listed below. Check all cartons to ensure they are same batch code. Color variations may occur between batches. Most chemicals will not stain. Pet urine can cause liter tile colors to yellow. Remove chemical spills as soon as possible. Petroleum product may cause tile to deteriorate if left unattended. Recommend using sealer for animal applications. Any non-slip vinyl wax or sealer will add to the ease of cleaning. Flexi-Tile’s impervious surface means that it is quick and easy to clean. Damp mopping or hand scrub is ideal. If unsure what products are safe to use on Flexi-Tile, please contact the manufacturer for recommendations. In addition, we advise you test a new cleaner, sealer, or adhesive on the tile by applying a small section and seeing how the product reacts. White tiles may discolor if using bleach on the tiles, bleach is not a recommended cleaner. Cleaner: For stains, or deep clean recommended Purple Power Industrial Strength Cleaner and Degreaser. Spray on surface, let set for several minutes but do not let it dry on surface. Wipe clean with cloth. After rinse with clear water. *Use plenty of clean rags, don't use dirty rags. Clear Sealer: recommended in high traffic or commercial installs. Use Armstrong Shine Keeper for no wax vinyl and linoleum. Follow directions on bottle. After floor is clean or on new install apply one light coat for gloss and protective seal. Optional Adhesive: recommended in commercial applications with heavy equipment traffic and uneven floor surfaces. Para bond - Solvent Free Acrylic Wall Base Adhesive. Apply adhesive with a 1/16 inch notch trowel. Knock down the adhesive with the smooth side of the trowel picking or spreading any access. Let stand for 15-20 minutes before applying tile. Optional Adhesive: Henry 430 - Premium Commercial Tile VCT Adhesive. Apply adhesive using thinnest trowel available. Wait 30-90 minutes until adhesive is dry to touch (tacky but no transfer to fingers), install tile. Do not wet tile for 5 days after install with Henry 430. The bottom of our hidden interlocking tiles have locking tabs and a waffle pattern that provides additional strength and stability to the tiles. 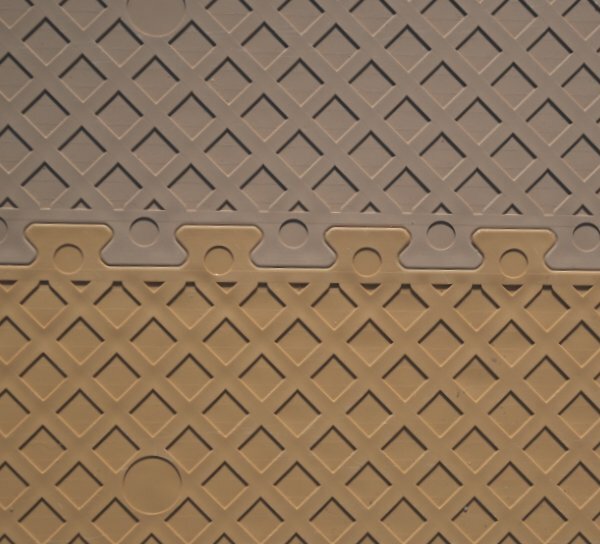 The locking tabs connect underneath the tile, where the top of the tile has a seamless appearance. Flexi-Tile Commercial / Domestic tiles are made from polymer thermoplastics and are therefore resistant to most chemicals. We offer a long lasting guarantee for your professional flooring. The tiles have excellent thermal and sound reducing qualities. Anti-Static tiles are available in all colors. Black Flexi-Tiles are the most fade resistant. For more extreme cases of direct sunlight, higher concentrations of UV Stabilizer can be added through special order. Please note: Animal urine and feces can cause the tile to discolor. Sealer recommended with animals. Acids in some food products like tomato paste may cause white tile to discolor.